Rosy Aindow examines the way fiction registered and responded to the emergence of a modern fashion industry during the period 1870-1914. 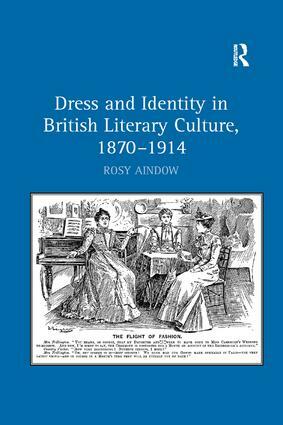 She traces the role played by dress in the formation of literary identities, with specific attention to the way that an engagement with fashionable clothing was understood to be a means of class emulation. The expansion of the fashion industry in the second half of the nineteenth century is generally considered to have had a significant impact on the way in which lower income groups, in particular, encountered clothing: many were able to participate in fashionable consumption for the first time. Remaining alert to the historical specificity of these events, this study argues that the cultural perception of the expansion of the industry - namely a predominantly bourgeois fear that it would result in a democratisation in dress - had a profound effect on the way in which fashion was approached by contemporary writers. Drawing on existing cultural analogies that associated fashion with women and artifice, it concludes that women were particularly implicated in fictional accounts of class mobility. This transgression applied not only to women who wore fashionable clothing, but to those working in the fashion industry itself. An allusion to fashion has a socio-specific meaning, one which gained a new potency in late nineteenth- and early twentieth-century narratives as a vehicle for the expression of class anxieties. Contents: Introduction; The function of dress in the novel; Development and innovation in the 19th-century fashion industry; Writing out frivolity; Fashion and the art of (class) deception; Needlewomen and shop girls in 19th-century fiction; Epilogue; Bibliography; Index.